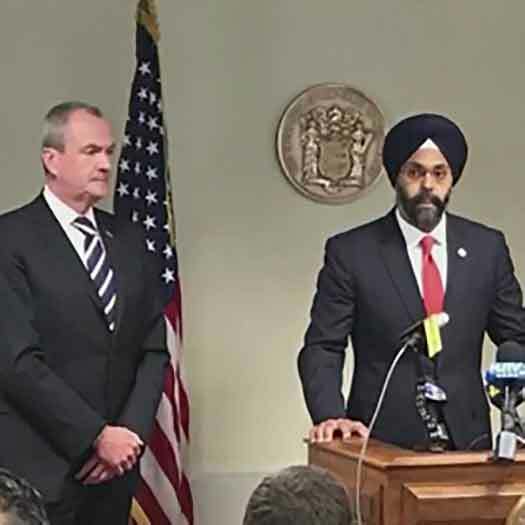 New Jersey State Attorney General Gurbir Grewal said his office has filed to join in a lawsuit challenging President Trump’s ban against transgender citizens serving in the military. The directive was initially delivered via Twitter. It is currently stalled in the face of several legal challenges across the nation. “As our amicus brief makes plain, we believe that the full participation of transgender persons strengthens both our military and our nation,” Grewal said in a statement. He went on to say that the ban “doesn’t just demean our armed forces” but is also unconstitutional. When Trump declared that he would keep transgender people from serving in the military, the social media posting immediately drew criticism from LGBT and many civil liberties advocates. The President even received push back from members of his own Republican party and retired Generals from the military. Three federal courts thus far have rulings against the transgender military ban. One court ruling was that the military be required to allow transgender citizens to enlist as of the first of this year. New Jersey joins Massachusetts, the state that initiated the legal action. California, Connecticut, Delaware, Hawaii, Illinois, Iowa, Maryland, New Mexico, New York, Oregon, Pennsylvania, Rhode Island, Vermont, and Washington D.C. are also a part of the legal action as of today. Under newly sworn in Democratic Governor Phil Murphy, the New Jersey Attorney General’s office has taken major steps to stand against the Trump administration and its draconian policies. New Jersey has also signed on to a multi-state lawsuit against the Federal Communication Commission’s dismantling of net neutrality and filed a letter opposing the government’s determination to allow offshore oil drilling just off the New Jersey coast. The moves mark an abrupt departure from the Attorney General’s office under Republican Governor Chris Christie, a Trump supporter and advocate.